You need the right drill for a job, and the right drilling technique to handle any situation. Having the correct drill bits and drill accessories allow projects to be done efficiently and more to the point correctly. The importance of good clamping systems in the shop is often overlooked, make sure you have the right clamps before you begin a project, and make sure you choose the right clamps for the long-term. Buying your first cordless tool should be a carefully thought out process. Not only are you purchasing a specific tool, you are also buy into a specific battery type system. Unless you plan on having multiple expensive batteries around your shop, you need to consider all the offering from a manufacture at the voltage level you might be purchasing. Over time cordless tools have and will continue to replace corded power tools. Most top of the line cordless tools work just as well as there corded counterpart, as battery technology improves corded power tools will become more obsolete. There are a number of different type of drills available to the woodworker. Learn the difference between them so that you will know which to use in any situation that comes up, and which you should be purchasing for you shop. The a different techniques for drilling different types of holes. Learning different techniques and why they work will help you choose the right technique when various situation arise. The are different type of drills, and each has different accessories and dozens of drill bits. Know which drill bit you need, how to use them, and which accessories you need and which you will want. 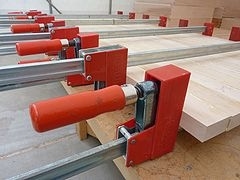 Clamps are essential to many types of woodworking, using the right one will allow you to correctly complete your projects. Many have generalized uses, some are specialized, you need to know what your options are to have the proper ones on hand. Knowing how and when to use specific woodwork clamp systems or which clamp-size will allow you to handle any basic projects. Know what to do in more advances situations, it often takes some knowledge plus a little creativity.